Here’s an idea for a Christmas craft to do with a child. Simple to make and looks great. The materials should be available from any local craft store. In my case most of the items came from HobbyCraft. The paper was bought on a roll, looking a bit like wallpaper. These cost over £4 each colour, but that includes plenty for future projects. The blue sky colour was cut to length and fastened to the wall using drawing pins. The same was done with the white for the snow, but the snow was cut in a wavy pattern as though it is drifted snow. An alternative is to glue smaller pieces of paper together although that does not look as good. Next the ribbon was glued around the paper as a frame. The ribbon was cut to size and glued on using a hot-melt glue gun [adult help required]. The snowmen and Christmas tree are made from foam. This is available in A5 sheets; it is often cheaper to buy a bundle of different colors. The snowmen were bought pre-cut as the basic shape, but the Christmas tree was measured using a template cut out of paper and cut out of a single sheet of foam. The coal was created by cutting thin strips of black foam, cutting them to size and then trimming the corners in irregular patterns. These were stuck onto the main shapes before glueing the whole thing onto the paper on the wall. To create the snow effect on the Christmas tree it was sprayed lightly with snow effect spray. The spray does not dry so care has to be taken when handling and sticking it to the wall. Finally the snowflakes were added. These had been made the day before to allow the glitter to dry before handling. 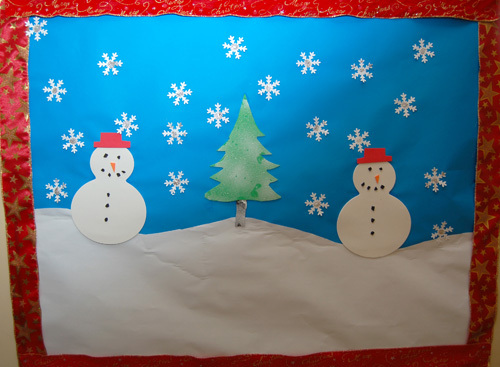 The shape of the snowflakes was punched out of plain card using a craft punch. The punch was quite expensive at about £8, but can be used for many years to come, you can also get smaller ones for about £3 – £4, but these were out of stock coming up to Christmas. A cheaper alternative is to use a snowflake stamp and white paint, although I was unable to find an appropriate snowflake stamps when I went looking. If using a stamp straight on the wall then be sure to use a small amount of a thick paint to reduce the risk of drips. That’s it. The snowflakes had been made the day before (only a few minutes to make), but the rest was all done in less than a couple of hours and looks great! This entry was posted on Tuesday, December 23rd, 2008 and is filed under Children, Crafts. You can follow any responses to this entry through the RSS 2.0 feed. Both comments and pings are currently closed.